Very revealing little dustup on Wednesday after the White House celebration of the tax cut bill. 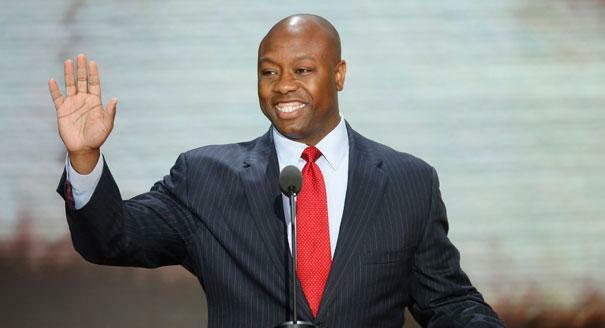 Andy Ostroy of the Puffington Host tweeted out that South Carolina Republican Senator Tim Scott, who spoke prominently at the Rose Garden rally, was a Republican “prop,” because Scott is black. For the racist identity politics left, your skin color is supposed to determine your ideology; hence any black Republican has to be a “token” or a “prop” (as well as an Uncle Tom). But in truth the racism displayed by Ostroy is actually much worse than the insidious identity politics premise behind it. 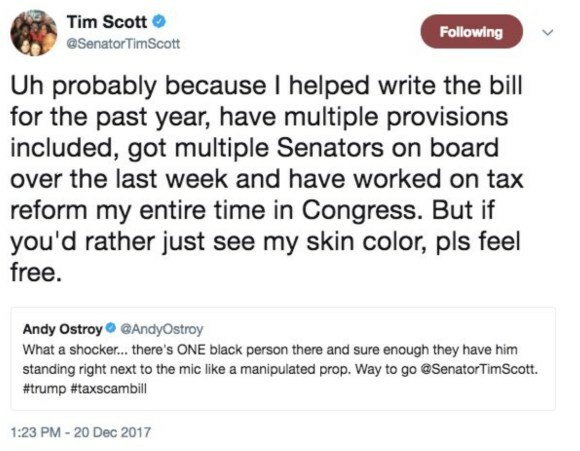 One reason people like Ostroy think Scott is a “prop” for Republicans is that most blacks in Congress are props for Democrats. But is there really anyone in the Democratic caucus who doesn’t know that Maxine Waters is crazy? Or Sheila Jackson Lee? Or Hank Johnson, the Georgia Democrat who worried that Guam would tip over if more U.S. armed forces were based there? Or former Florida Democrat Corrine Brown, recently convicted of corruption and sentenced to prison? Or that John Conyers, cashiered with great reluctance (because he’s a “legend” don’t you know), was effectively senile? The patronization of the Congressional Black Caucus by the Democratic leadership is one of those obvious Washington phenomena that everyone is embarrassed to speak openly about. Members of the Black Caucus are always prominently included in Democratic press conferences for exactly the reason Ostroy thought Tim Scott was included at the White House tax rally. It was only natural Ostory thinks that way about Scott, because that’s how liberals secretly think about minorities themselves. Sometimes the mask slips, ever so slightly. Postscript: I discover that Ostroy took down his tweet and apologized to Scott.